West Signs installing the WorkSmart sign. Fantastic folks to work with! The talented, Nick Rollo Jazz with his saxophone playing the WorkSmart ribbon cutting. National Blueberry Muffin Day was a good excuse to start our workday with a B2B Meet&Great! 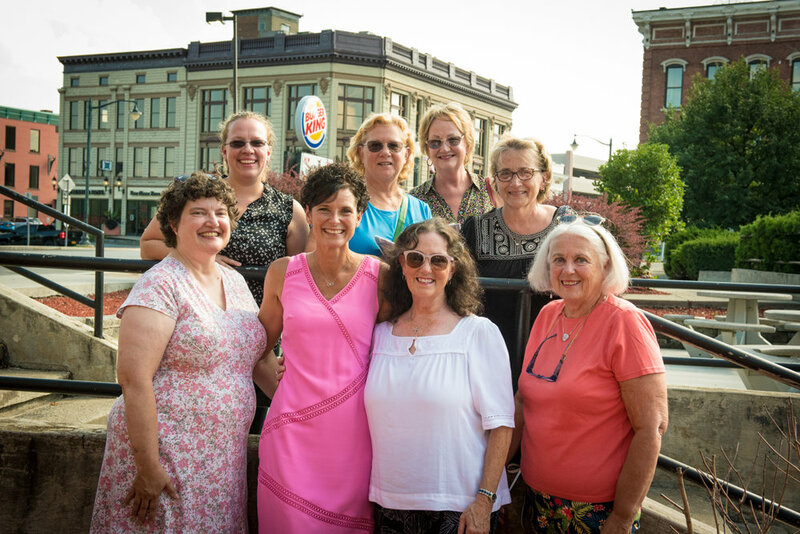 Soroptimists International of the Adirondacks came out to help me celebrate our launch in August. What a great group of ladies working to support local women and girls and the organizations serving them. WorkSmart’s conference room offers a great opportunity for interaction among attenedees. The WorkSmart community was able to enjoy breathtaking photos of Vermont landscapes when artist, Kate Paquette arraigned her display. Our ribbon cutting hosted by Adirondack Regional Chamber of Commerce was enjoyed by many. Local artist, Nancy Philo created a beautiful display of her work for her exhibit Here and There, A Passion for a Place. The exhibit featured a range of Nancy's latest acrylic and watercolor creations inspired by her time spent in Sante Fe, New Mexico and the Adirondacks of New York.